I was getting ready to make Cranberry Orange Bread when EK told me that I need to use the bananas are they are getting too ripe. Does cranberry goes well with bananas? Sure they do! 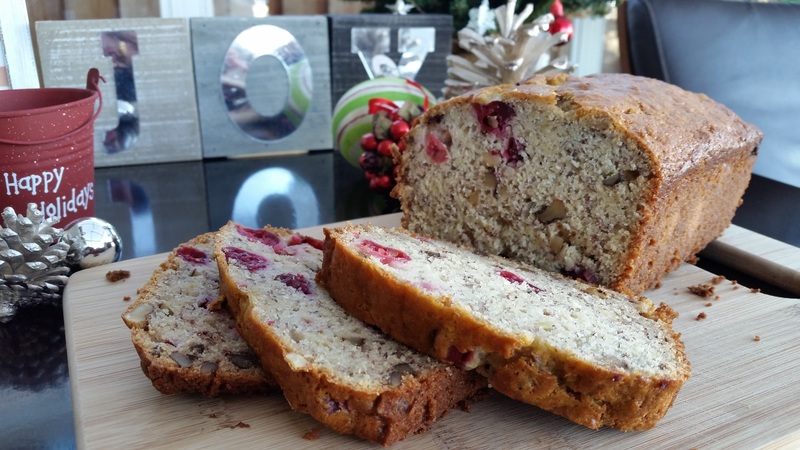 Now I can combine the sweetness of bananas and the tartness of cranberries all in one bread. This is my new discovery of the week! Mix flour, baking powder, baking, salt, nutmeg, cinnamon in a mixing bowl. Cream butter and sugar in a standing mixer until light and fluffy. Mix in milk and mashed bananas. Fold in flour mixture until moistened. Stir in cranberries and chopped walnuts. Bake for 70 minutes or until wooden sticks come out clean.